Looking back on 2010-11, Leamington Chess Club had a very encouraging and enjoyable season in the Leamington and District Chess League. The Club ran four teams – one in each of the four divisions. Several players who had joined the Club in 2010 had their first full season playing in the League, and this made the job of the four Team Captains rather easier – with a larger pool of players to call on. In Division One, the A Team enjoyed a reasonable season, finishing in fourth place behind Olton A, Solihull Checkmates and Solihull A. Olton A were clear winners again and never really looked like being overtaken during the season. In the Second Division the B Team finished towards the bottom of the table after a very promising start. Adrian Walker and Ben Graff enjoyed good seasons during their first full year at the Club. The C Team did very well in Division Three finishing in second place and being right in the title race for most of the season. Congratulations to Roy Hadfield and Jason Madden of this Team. Roy had the best overall League results of all our players with 7 out of 10 for his League games. Jason provided the Club with its only Honour in the League by winning the under 140 Individual KO Cup with a convincing 2-0 victory in the Final. The D Team had a difficult season and although they finished bottom of Division four, it was so tight at the bottom with three teams being separated by only one point. Congratulations to Mark Armitage whose victory on Board One against an opponent from Shirley who outgraded him by 37 points, gave Mark the Club’s trophy for the best individual result in a League game. Well done also to Tom Bridson who played his first full Season for the Club and had a very creditable overall performance. In the Team KO Cups we entered one team in the Open, one in the Under 700, and two in the Under 120 Cup. None of these Teams made it through to the Finals, which were held at Leamington Club at the end of April. For the coming season, commencing September 2011, we will be fielding four League teams again, with one in each Division and four Cup teams. We are also planning to enter a team for the first time in the National KO Cup run by the ECF. We are always delighted to welcome new players of any strength, so if you are thinking of taking up chess, or are an existing player looking for a club, then please contact us or come along to a club night at The Home Guard Club in Portland Street on a Tuesday. Finally, here is an interesting game and a fine win by Mark Page for Leamington A against Banbury B in the league match between the teams. Annotations are by Mark. 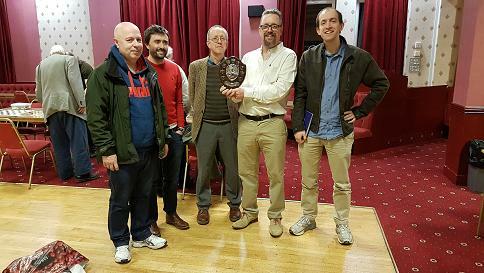 Looking back on 2011-12, Leamington Chess Club had a very encouraging and enjoyable season in the Leamington and District Chess League. Our members have been very active in a range of League, Club and other events and next season promises to be another exciting one. Congratulations to Adrian Walker who is our new club champion. Adrian won the All-Play-All event by a huge margin and went on to beat Andy Price in the Play Off Final, following Andy’s equally good win in our knock out event. Congratulations also to Mark Armitage for winning the U-125 All Play All and to Andy Collins who won our inaugural Plate Competition. A special mention also to Roy Hadfield, who had an excellent run to the final of the Knock Out. All of our competitions were extremely well supported and a lot of enjoyable Chess was played. We will be running the same events in 2012/13 with the All-Play-All starting again in June and the Knock Out Competitions towards the end of August. Steve Burnell will be in touch with you all, to book your entries! The Club ran four teams – one in each of the four divisions. A number of players who had joined the Club in 2011 had their first full season playing in the League and their excellent contributions all made a big difference this year. The influx of new talent should certainly stand us in good stead next year. In Division One, the A Team enjoyed a reasonable season, finishing in fourth place behind Stratford, Olton A and Banbury. Congratulations to Andy Price whose victory against Alan Lloyd of Stratford who outgraded him by 32 points, gave Andy the Club’s trophy for the best result in an individual League game. In the Second Division the B Team finished sixth in a league which did not have much to choose between any of the teams. Ola Oladejo and Tom Darling had very good first seasons for the club and wins for the team against second placed Banbury B and third placed Solihull B were amongst the highlights. The C Team finished seventh in Division three, but again there were a lot of positives. Andy Collins had a very strong first season for the club on Board one and the team drew with the eventual winners Olton C.
The D Team were our most improved team, coming fourth in Division 4 this year, having been bottom last year. Ben Egid 5/5 and Richard Lorch 3/3 led the charge in their excellent debut seasons for the club. In the Team KO Cups we entered one team in the Open, two in the Under 700, and one in the Under 120 Cup. It wasn’t really our year in the Cups this year, but we did manage to reach the final of the Open, before losing heavily to an Olton team who outgraded us significantly. For the first time, Leamington entered a team in the National Club Championships. We lost narrowly to both Rushall and Alwoodley, but these were enjoyable matches and we will enter a team again next season. Leamington players featured strongly in Leamington and District Chess League individual events this year. Adrian Walker and I shared joint first in the U-150 section of the Leamington rapidplay with 5/6. Jason Madden reached the semi final of the League Open Championship. I reached the final of both the Open and the U-140 and probably wished I hadn’t, but I did pick up the League’s trophy for best game prize which was something. At our AGM Steve Burnell stood down as Chairman and Guy Greenland stood down as Secretary. I took up the position of Chairman and Tom Darling became our new Club Secretary. I wanted to again take this opportunity to record my thanks on behalf of all of us to Steve and Guy for all that they have done for the Club in these positions over the past few years. The Club really is in great shape and we owe them a big debt of gratitude. Of course Steve remains our A team Captain and is now also our tournament organiser, so no rest for the wicked really! I also wanted to record my thanks to Mark Page, who is leaving Leamington to play for Kenilworth (which is where he lives) after 84 games for us. Mark has been our Board one for a long time and has played a massive part in the success of our A team over the last few years. We will miss you Mark and wish you well (except for when you come back with Kenilworth to play us!) Mark’s favourite game for Leamington is below. Having won most of our trophies, Adrian Walker is also leaving the club, as he is moving to Stroud. (Albeit, he might still have time to win this seasons All-Play-All if he is quick!) Adrian’s energy and enthusiasm will be greatly missed, as will his ability to predict likely opponents first 15 moves. Can we still borrow your data base Adrian?!? Roy Hadfield is also leaving to pursue other Chess interests. Roy is a former Chairman who has served our club with distinction in a number of different capacities over the years and we wish him well. It has been an overall positive season, marked by solid and occasionally spectacular form in all four divisions of the league, as well as numerous good runs in the individual KOs. A first ever victory in a National Club KO rounded out the season in style. The A Team finished in 6th position out of 9. The highlight was a 3.5-0.5 win at Daventry, which also saw Dan Aldridge hand the 207-rated Chris Ross his only defeat of the season. After a bad start, the B Team rebounded to finish 4th of 7. They achieved a rare 4-0 win; somewhat improbably, this came away from home against eventual winners Banbury. The C Team came 7th of 9, although they might have finished substantially higher if not for miscommunications which led to multiple games being forfeited. The highlight was a 2.5-0.5 win at eventual champions Shirley. After a good start, the D team were disappointed to finish 7th of 9 with a record of W5 D2 L9, though they did finish a long way ahead of the bottom two. There were also some good wins; like the B and C teams, they won against the eventual champions, 2.5-0.5 at Olton. Leamington entered one team in the Open, two in the U700, and one in the U120. However, as these teams combined for 1 win in 5 matches, perhaps the less said about these the better! There were several close defeats, and reason to believe that we can improve on this showing next year. Leamington were represented in each of the four finals. Andy Collins came up against frequent champion Colin Searle in the Open final, and took the opening game after a long and fluctuating struggle. Colin fought back in game 2, however and after a win each in the tie breaker won an epic match in game 5. The U150 final was contested between two Leamington players, Tom Darling and Ben Graff. After escaping with a draw in game 1, Tom edged the 2nd game to win the title. In the U120, Guy Greenland made it all the way to the final. There, he fought back from a defeat in game 1 to force a tiebreaker, but his opponent, Stuart Calderbank, ultimately prevailed. Peter Leggett was our representative in the U90 final. He was unlucky to come up against a player in Michael Woodford whose grade has since risen into the 150s, but still managed to rebound from an initial loss by forcing a creditable draw in game 2. 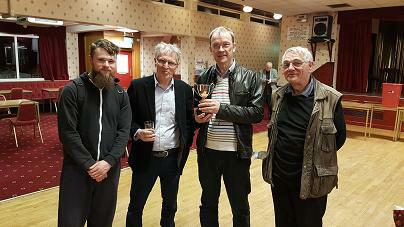 Dan Aldridge, who had to withdraw from the previous year’s Knockout, won back his title after seeing off Steve Burnell (on the 2nd rapidplay tiebreaker), Tom Bridson, Andy Price and Ben Graff. Meanwhile, a strong Plate competition saw Ola Olaleye defeat Steve Burnell in the final. In the All-Play-All, Tom Darling edged Steve Burnell by half a point for the title, helped by playing 7 more games than his rival. The U125 award went to Peter Leggett. Tom also won the Club Championship, defeating Dan 1.5-0.5 in a pair of rapidplay games courtesy of a risky gambit in the 2nd game. The George Boots Shield, given for the best single game performance was won by Andy Collins, who overcame a 38 point gap to defeat C Searle (128 v 166) in game 1 of their Open final. Leamington secured victory after a dominant showing against clubs from Bushbury, Alwoodley and Maidstone. Across the three matches, which were played in Leamington, Leicester and London, the team won 7 games, drew 4 and lost just one, and every player who took part returned a plus score (Steve Burnell 2/3, Ben Graff 1.5/2, Tom Darling 2.5/3, Andy Collins 2/3, Guy Greenland 1/1). Our gratitude goes to two members who are leaving after a number of years of service. Guy Greenland is moving away from the area; he had been a member of the club for over a decade and also helped to run numerous tournaments in the region. Reg Warnes is retiring after half a century at the club; he has remained a strong player well into his 80s and took an A-Teamer to a replay in his very last club Knockout match. Both players will be missed, and we wish them both well in the future. It’s been an eventful year, with a pretty even mix of very good and rather bad results. The biggest disappointment, of course, was the last place finish and probable relegation of the A Team. A terrible first half of the season saw 1 win and 7 losses in 8 games, and despite a late revival which brought a rare three wins on the spin, a last day defeat to the champions Kenilworth A left the team a point from safety. Rather more reason for cheer was provided by the B Team; they used an excellent start to reach 3rd place out of 7 teams, their highest finish for many years. Ben Graff’s win over the 190-rated Andrew Paterson was a particular highlight. The C Team were another side who got off to a good start; they were threatening to reach first place around the mid-way point of the season. They slipped rather in the second half, but their finish of 6th from 8 teams was deceptive given that they were only six points from the top and had an even record of W5 D4 L5, with a +2 game difference. The D Team proved consistent with last year, with an identical finish of 7th of 9 and the same number of wins (5). They were the only Leamington team to achieve a whitewash, twice besting Kenilworth D 3-0. Leamington entered a team in the Open, U700 and U120. The U700 team was only one to muster a win, and Leamington were once again not represented in the Finals night which we hosted. Maybe next year? League Competitions Officer Jason Madden introduced a new handicapped rapidplay KO for this year, which Leamington players had substantial success in. Jason reached the Semis, while Ben defeated Tom Darling in the Final, meaning that a Leamington player won one of these competitions for the second year in a row. Rob Mantell, playing in the U90 for the first time, reached the Final and only lost after he took his opponent to a rapidplay replay. There were also Leamington players in the other three competitions, with top performers being Mark Armitage in the U120 (Quarter Finals), Jason Madden in the U150 (Quarter Finals) and Tom Darling in the Open (Semi Finals). With defending champion Dan Aldridge missing the Club KO, it was tough to predict the winner. Tom Darling managed to come through, winning tough matches with Ben Graff, Steve Burnell and Andy Price, all of which went to tiebreakers. Meanwhile, Ben edged Ola in the Plate. Tom also won the All-Play-All for the second year in a row, winning six games in the final month of competition to edge Ben by a point. The U125 award was comfortably won by Jason Madden. The Club Championship is given to the winner of a match between the Club KO and All-Play-All winners, so Tom also took this award. The George Boots Shield, given for the best single game performance was won by Ben Graff for his aforementioned giant-killing; he overcame a 45 point gap (145 v 190). This competition took on a new format this year, taking place over a single weekend in High Wycombe. We were defending champions in the Intermediate section, and easily won our first two matches to reach the final. Unfortunately, Bedford then proved the better team, and we had to settle for 2nd place. Still, a fun way to spend a weekend, and we intend to send at least one team next season as well. Simon Harris, a popular member who had served as both a team captain and Treasurer, appears to have left the area. We lost contact with Simon early in the season, and hope that all is well with him; he shall be missed. This was Leamington’s best season over the board for some time, though on the down side we did lose some of our stalwart players for various reasons. The A team were able to return to the top division at the first time of asking, dominating in Division 2 with 11 wins, 2 draws and 1 loss. All five regular players scored over 50%, and Dan, Adny Price and Andy Collins didn’t lose all season. Also in Division 2, the B team were doing well until we lost a few players; they then had difficulty fielding a team. Forfeiture of their last two games saw them slip to 7th. Early on, it seemed that the C team might run away with Division 3, but Alex moving back to Spain made things harder in the second half of the year. They still came third, only three points off first place, and never had a loss worse than 2-1 all year. Jason scored 11 points from 12, becoming the first Leamington player to get his name on the Stanley Gibbins Trophy, and Ola won the best game prize for his win against Colin Searle. The D Team had their best finish for some time, 5th out of 9, and welcomed a new player, Sumiran, who finished with a plus score in his first season. Leamington entered a team in the Open, U700 and U120, and all three made the semis. The U120 team went on to reach the final, our first for a long time, though they ultimately lost 3-1 to Banbury. Our best haul in some time, with two of the five competitions won by Leamington players. Ben defended his Handicapped Rapidplay crown from last year, and Ola added the U150 title. The KO Cup was won by Ben for the first time. He knocked off Tom B to reach the semis, then beat Tom D and Ola after replays. Andy C picked up the plate for the second time. Tom D won the All-Play-All for the third year in a row, good scores against his main rivals seeing him home by a point and a half. The U125 award was comfortably won by Jason Madden for the second time in a row. The Club Championship is given to the winner of a match between the Club KO and All-Play-All winners. Tom and Ben each had a rapidplay win as Black, before Tom won the tie-breaker, again with the black pieces. The George Boots Shield, given for the best single game performance was won by Peter Leggett this year, beating a player rated 35 points above him. This tournament moved to Birmingham but kept the same format. There were several more teams in our section this year (U150 average). We came 5th out of 10, wins in our first and third matches being offset by losses in the other two. It was a fun tournament, and we certainly intend to be back next year. Steve Burnell moved back to the north after nearly 30 years in the area, playing for Kenilworth then us. He reminded us what we’ve been missing only a few months later, representing Braille Chess at the NCC and beating Tom in a 60 move epic. Alex Bonillo had only been with us for a few months before returning to Spain, but made a major impact, pushing the C team to the top of the table with his exploits on board one. Dan was another big loss. His move to Ireland finally went through late in the season, but he’d already helped ensure prmootion by then, so left on a high. Undoubtedly the biggest loss was David, who unexpectedly died during the season. You can read more about his eventful life on his memorial page. We should also mention former player Towan Kosted, who died last month. Towan was well remembered as a player and captain by all those of us who knew him. Leamington had an outstanding season this year, winning a good share of the league silverware, both in team matches and individually. The A team held fast in a competitive Division 1, consolidating their position, having returned to the top flight at the start of the season. Captain Tom Darling won 57% from 14 games, losing only three times. The team were ably abetted by new member Blake Morgan holding his own on the top board of the league. Due to unforeseen circumstances the B team had to drop out of division 2. The C team were joint winners of Division 3, winning 10 and drawing 1 match out of the 15, with their victory sealed in a nail-biting final result which was out of their hands. In a very welcome return to the club, Rob Gill scored an awesome 88%, taking 3.5 points out of 4 on a competitive board 1. Bogdan Boraciu took a similarly staggering 85%, with 11 out of 13, including a number of comebacks which amazed onlookers, who saw near-doomed positions brought back from the brink. Yet another significant contribution came from Nigel Morris, who took a substantial 71%, scoring 10 out of 14. Division 4 was also won by a Leamington team, with the D team taking 10 wins and a solitary draw from 14 games. A deep and strong squad included newcomer Joshua Altamura taking 88% with 3.5 out of 4 games and three players scoring 100% records: fellow newcomer Richard Stone-Johnston, Sumiran Lohani and Richard Lorch. No squad member took less than 50% from their games, a remarkable statistic. Two of our KO teams won their sections, the U700 and U120 teams, with the open team knocked out first round. In the U700 Tom Darling was undefeated on board 1 and Captain Jason Madden and bottom board Rob Mantell similarly remained undefeated in the competition. In the U120, captain Mark Armitage was also undefeated, ably supported by Joshua Altamura, who won in both the games he played. In the final Roy Hadfield and Peter Leggett both won their games, along with Joshua, which combined with Mark’s draw meant an emphatic victory against Solihull. Oladejo Odelaye won the the open competition, seeing off chairman Tom Darling, Peter Drury and Jason Madden, after last year’s U150 title. Joshua Altamura continued his excellent first season by winning the U125 cup, beating Sumiran Lohani, Rob Mantell and Steve Rumsby along the way. The KO Cup was won by Tom Darling, who beat Andy Price, Tom Bridson and Sumiran Lohani. Ola won the plate, triumphing over Andy Collins in the final. Tom D won the All-Play-All for the fourth year in a row with a mighty 23 out of 26. The U125 plate went to Rob Mantell for the first time, with 5/15. The Club Championship is usually given to the winner of a match between the Club KO and All-Play-All winners; when the same player wins both of these, he plays the plate winner. This meant that Tom D took on Ola in a pair of rapidplays, managing to win both. The George Boots Shield, given for the best single game performance was won by Peter Leggett for the second year in a row, this time beating a player rated 52 points above him. We came runners up in the minor section this year. Good performances from Tom D and Andy C on board 1 were ably supported by a 3.5 from 4 from Peter. Sadly Joshua Altamura moved on from the club after a barnstorming first season, moving to Oxford for work. Our recent promotions meant that all three of our teams were in relegation battles this season, with two of the three managing to stave off the drop. The A team started well, with three wins out of the first four matches. Once our star player Morgan Blake (4/5) left the area, points became harder to come by, but we had enough in the bag to secure our place with a few games to spare. In Division 2, the B team also started well, but struggled to field a full team in the middle of the season, leading to a couple of costly forfeits. Andy Price came in and helped the fight with 5.5/8, but a narrow failure to draw the last game at Solihull sadly led to a relegation. The C team struggled early on in their first crack at division 3, losing their first five. As the season wore on, though, they managed some impressive wins, and beat Stratford 3-1 in a relegation showdown at the end of the season. Rob Mantell’s score of 4.5/9 was our best as the team upset expectations. We were unable to repeat last season’s success in these competitions, with the Open and U120 teams both failing to win their opening match. Jason Madden was able to add to our trophy cabinet, picking up the U125 trophy for the fifth time. Tom Darling (in the Open) and Ola Olaleye (in the handicapped rapidplay) also made finals, making for another solid year in these competitions. Ben Egid won the club KO for the first time, beating Ola in the final with a strategic masterclass. Tom won the rapidplay for the fifth time in a row, scoring 9/12 and beating Andy Collins in a series of four tiebreakers after they both finished with the same score. He also defended the club championship against Ben. Rob had another productive year, winning the Plate for the first time and repeating as the U125 rapidplay winner. The George Boots Shield, given for the best single game performance, was won by Peter Leggett for the third year in a row, this time beating a player rated 32 points above him. Peter’s big win came on the first day of this competition, an improbable comeback from a queen down. Sadly, that was an isolated highlight, as we won only one of our four matches. Sumiran Lohani returned to India early in the season. He was one of our most popular players while he was here, as well as being cnosistently successful over the board; we wish him well in his new job.